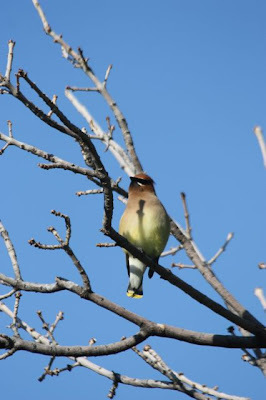 The sun was warm at Giant Springs, and cedar waxwings were basking. 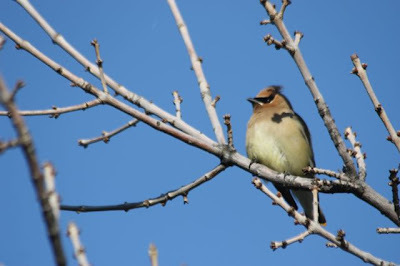 Smooth little dumpling birds, hanging in the bare branches like ornaments. 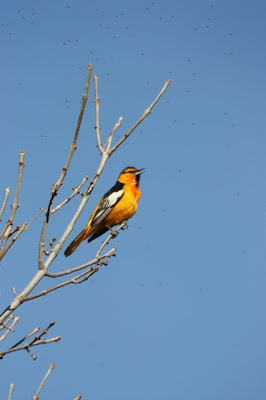 A Bullock's oriole flaunted his snowy epaulets in the same tree. 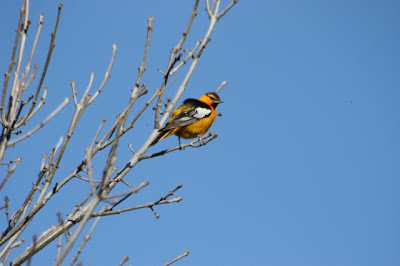 A firebrand of a bird, singing perhaps about the swarms of midges all around him, about abundance. While lower down, a least flycatcher sat her fluffy nest. Petrodchelidon pyrrhonota--the rock swallow with fiery ears. 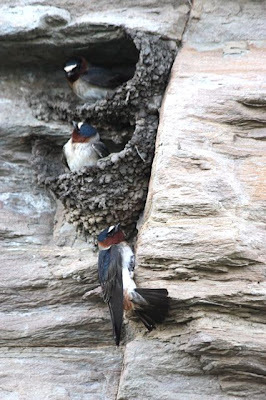 We're so used to seeing cliff swallows nesting on buildings, under eaves, and under bridges that it's a minor revelation to see them nesting on their traditional substrate. In Great Falls, Montana, there's a lovely park on the banks of the Missouri River called Giant Springs State Park. 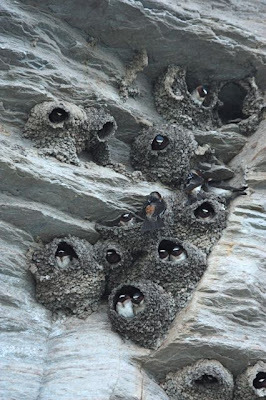 Here, a colony of cliff swallows has made its home. When we visited, the nests were largely under construction, leading to a number of pretty adorable photo-ops. The swallows gather mud on streambanks and in puddles, bringing little wads of it in their gullets, making thousands of trips for each nest. These seem happy to have made a place to perch. But there's much more to do. The little mud slings are rounded out into bowls. Pairs work together, trying to get the nests finished before the eggs come. I find it amazing that they can construct these elegantly cantilevered jugs without the whole thing just falling off. 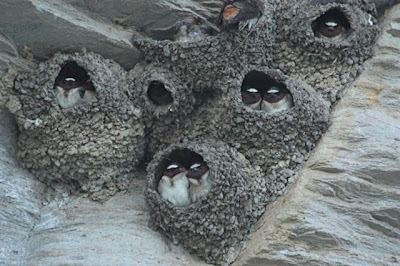 Cliff swallows have little headlamps of white that show up well in the dark nest interior. It's a clear signal that the nest is occupied. There's a lot of conversation between neighbors, and there's egg dumping and mate switching and even egg switching. It gets kind of crazy. 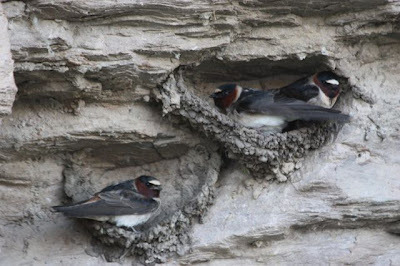 Charles Brown at the University of Tulsa has done fascinating studies of cliff swallow coloniality--its benefits and costs. 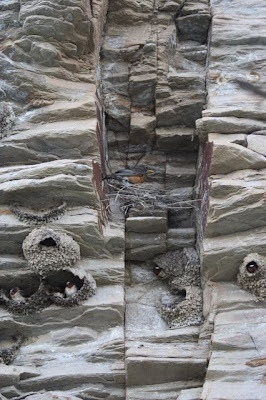 He discovered a new form of reproductive parasitism when he witnessed cliff swallows entering other nests with eggs in their bills. 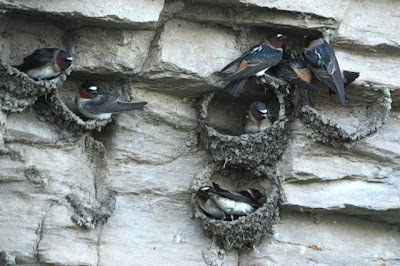 Not only do the swallows lay eggs in others' nests, but they may also carry their eggs in their bills and deposit them in others' nests. They'll throw out an egg in other nests, as well. It's puzzling why they do this. 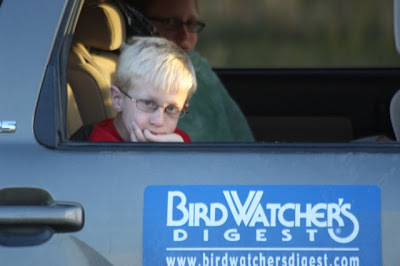 Perhaps they're hedging their bets, increasing the chance that their young will fledge by farming some out. 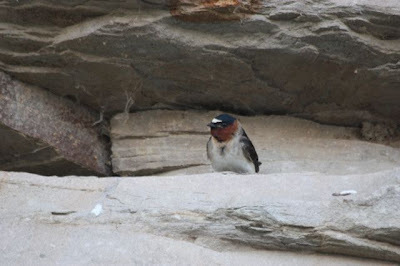 Years ago, I painted that scene, of a cliff swallow with an egg in its bill, for Dr. Brown's species account in the Birds of North America, but I don't have the original any more. He might have bought it. It's all lost in the mists of memory. 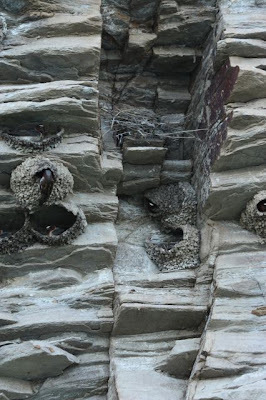 These nests are almost finished. A rainproof neck completes the construction, pointing downward. Eggs are usually laid before the entrance tunnel is complete. There are benefits and costs to living in a colony. 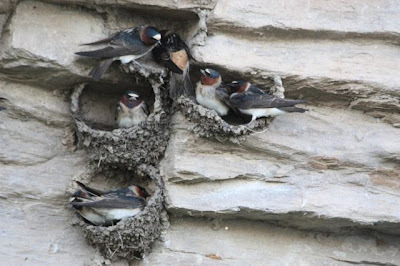 Brown discovered that, like honeybees, cliff swallows are able to communicate about food sources, letting other colony members in on an insect hatch, for instance. They seem to have specific calls that function as words, that are used only in the context of communicating about food. But tremendous ectoparasite loads build up in these nests, with lice, mites and bloodsucking bugs sometimes multiplying to crippling loads. All of which leads one to wonder why a robin would want to build her nest in the midst of a swallow colony. 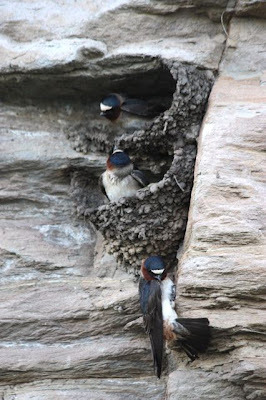 She had young chicks already, when the cliff swallows were just starting to lay eggs. I hope her young fledge before the swallow bugs build up. Looking at it another way, she's probably well-protected from hawks and other avian predators. 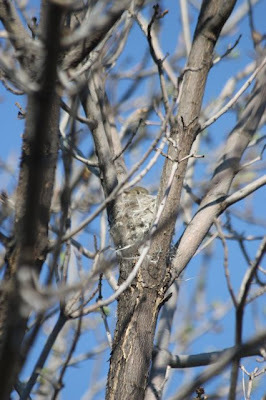 You can just see the yellow billtips poking up above the nest rim. 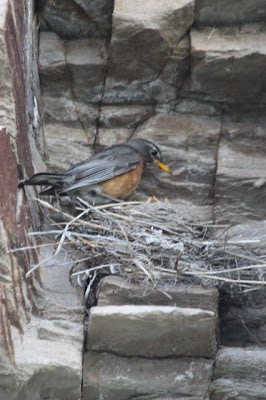 Good luck, Mrs. Robin. Charles Russell's narrative is as amusing as his cartoons. 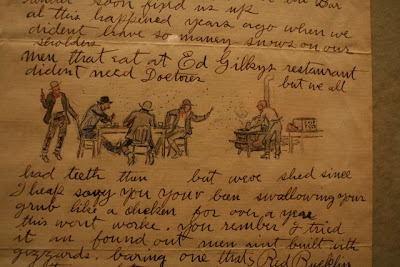 This one refers to his toothlessness, and the fragments I could read said, "I had teeth then but were shed since...when you've been swallowing your grub like a chicken for over a year..." What an image that conjures! 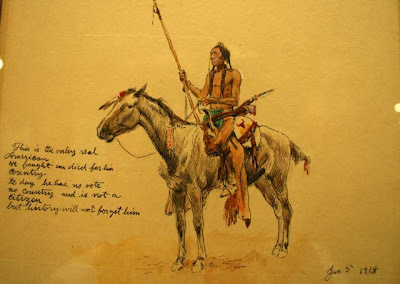 He worked as a cowboy in the Judith Basin of Montana from age 16-27, when he decided to become a full-time artist. He died in 1926, much too early, at age 62. More than 4,000 works make his an incredible legacy. The Charles M. Russell Museum has preserved his home and his log cabin studio with all the props, clothing, saddles, and accoutrements that lend his paintings authenticity. I love, love, love this museum. Nice letterhead, huh? I should emulate that, something so simple and iconic. Perhaps I could draw a pile of raccoon poo full of pawpaw seeds. If I ever used letterhead anymore...it's all electrons, ma'am. And your trail be smooth plum through. That horse fairly breathes. I think his tail just switched. This letter sketch completely flipped me out. Look at those horses, that action, that painting!! Good Lord! 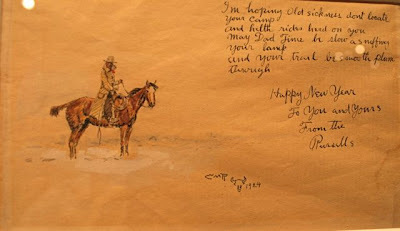 If I ever got a letter like this...and yet when I was young and had all kinds of time, I illuminated my letters to a beloved uncle, who was confined to a nursing home, in this way. I had to stop decorating the envelopes when they started disappearing before they reached their destination. Someone in the chain of post offices took a liking to them. Kind of like stealing flowers out of someone's garden. 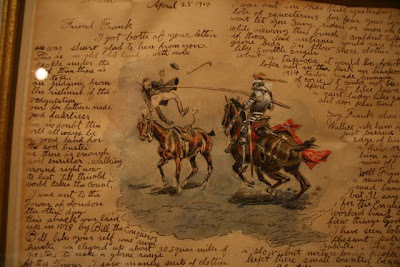 Charlie Russell's illuminated letters are compiled in a brand new book, available on the C. M. Russell Museum's web site. Mmm. Christmas. 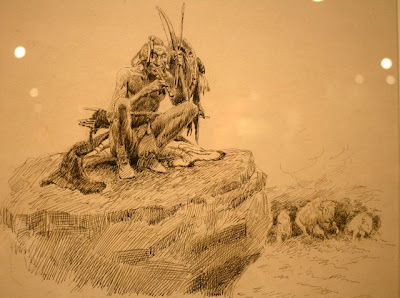 Liam stood rooted before this exquisite drawing of a shaman calling up three white buffalo. We felt shivers pass right through us. It was as if no time had passed at all. This is the only real American. He fought and died for his country. But history will not forget him. My father was two when this was painted. It hasn't been such a long time, after all. We are still so close to what was, what is wild and wonderful about our country. Moving to Montana soon...gonna be a dental floss tycoon. 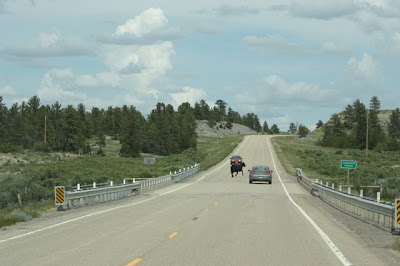 Well, we weren't moving TO Montana, we were moving toward Montana from our stint in North Dakota. And I was completely excited. See, when I was 12, I spent a summer in Opheim, in the northeast corner of the state near the Saskatchewan border. I was staying with my eldest sister and her husband in a little ranch house on the Air Force base there. The first thing I remember noticing is the sky, and the second thing was the way the lawn grass would lay down flat when the wind blew. I'd never seen that before. 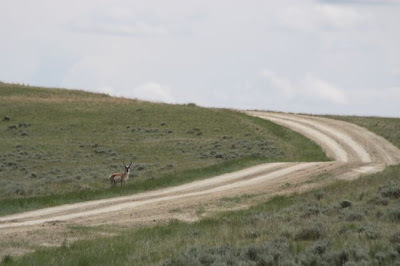 I also noticed horned larks, long-billed curlews, blue-winged teal, jackrabbits, coyotes and pronghorns. 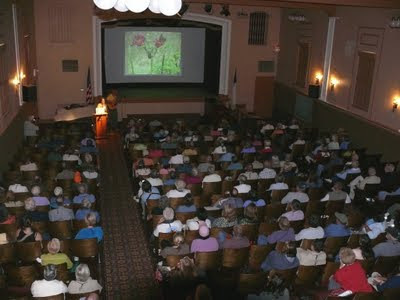 Eastern Montana was a budding naturalist's paradise. Heaven, to be plonked down in a biome that couldn't have been any more different from Richmond, Virginia, where I grew up. 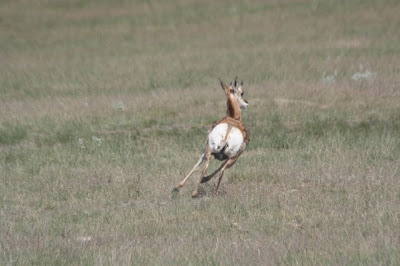 Pronghorns, North America's fastest land mammal, reign supreme on the Montana plains. 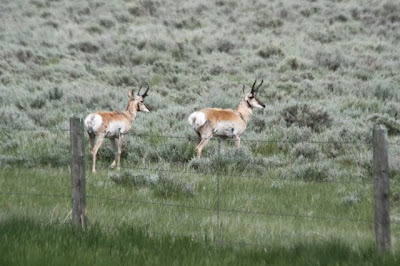 I love seeing pronghorns, these Pleistocene relics, these antelope in a world of deer. Well, they aren't really antelope, either, but members of their own family, the Antilocapridae. 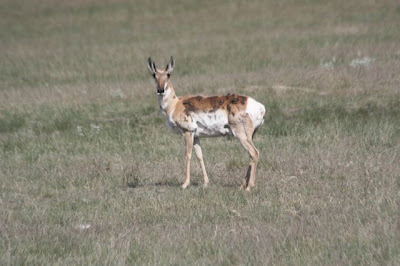 At one time more than 100 million pronghorn raced over the Great Plains of North America, but the same market hunters that eliminated the bison moved to scrub pronghorn out, too, lest the Plains Indians find something left worth eating on the lands we raided, raped and left desolate. 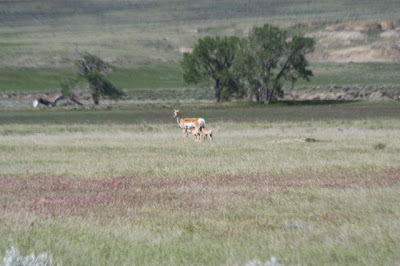 They almost succeeded, too, reducing pronghorn numbers to 34,000 by the 1920's. 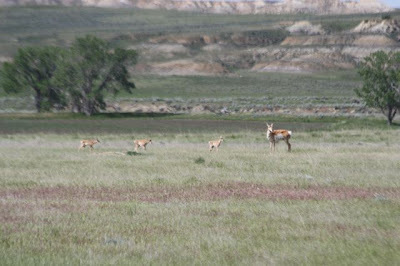 There aren't quite a million pronghorn in all of North America now, 1/100th of their former numbers. Think about that. And most of them seem to be in Montana. 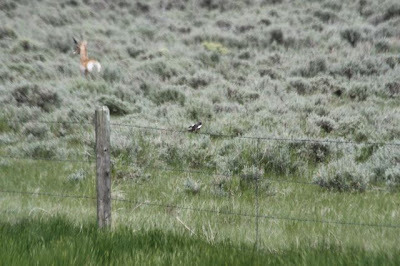 Wearing the equivalent of 8-power binoculars on either side of their heads, pronghorn don't miss much. They eye you carefully and turn tail quickly, seeming to form their opinion and act on it swiftly. That heart-shaped rump disc can be flared in alarm, letting you know you've been seen. Might as well not try to chase me; I can hit 60 mph if I need to, with a cruising speed of 30. 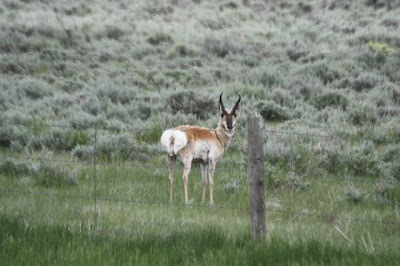 The pronghorn were looking pretty sheddy, pretty molty. This little gal was nursing, and she let us get closer than most, probably because a fawn was flattened down somewhere in the vicinity. Yep, nursing. See the udder and two teats? We did a double-take with this grouping. Has she got three fawns? Yes, a litter of pronghornlets, and we watched them all nurse at once. with a lark bunting on the wire! Bill and I chased lark buntings for most of a day, trying to get a photo, any photo, of these elusive and spooky little black birds. Those white shoulders! That song! Ah, well. 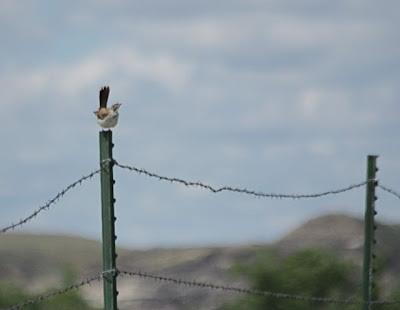 They're a signature bird of the Montana sage, one that lived in my memory, and it was a tonic to see them again, even if we couldn't get a decent photo. Poor Liam and Phoebe got quite fed up with our quest for this flighty little bird. Can we go somewhere, anywhere? Now? Did you get your picture? No? Pleeeease? Can we go? Sure. We can go. But there will be other sights to behold. This is open range. As in, fence-free. Talk about free-range grass fed beef! We don't see open range in Ohio, except when a calf gets out. Whoa bossy! Bonus points to anyone who can identify this little denizen of the sage. I've caught him in a particularly saucy pose. Zick and Billofthebirds performing music at the conclusion of my talk at the lovely and acoustically perfect Hoover Auditorium, Lakeside, Ohio. Photo by Jim McCormac. Art Exhibition Opening "Letters from Eden"
I'm hoping to feel a bit more zippy by Tuesday. Think I'll need to be on top of my game, with a show to hang and four talks to give. Come see me if you're in the area! 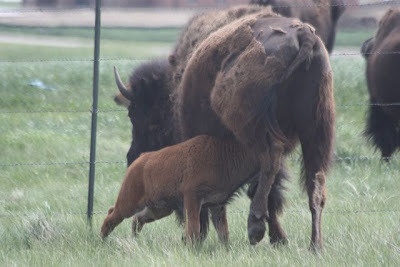 One of the hard things about having your tender and sensitive nine-year-old son be in love with bison is the sad, sad history of the animal on our Great Plains. 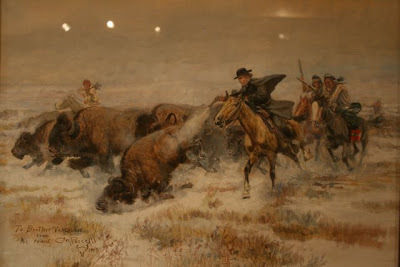 We entered the Charles M. Russell Museum's brand new bison exhibit in Great Falls, Montana with a little trepidation, knowing the story in advance. A thrilling surround film with thundery, grunty sound effects put us right in the middle of a stampeding herd. And then there came the bones. 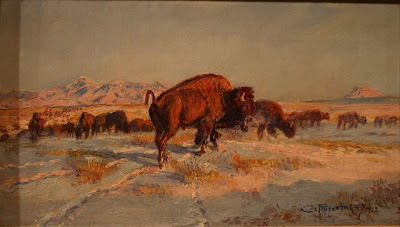 To kill off the American Indian, first you must kill off his primary food source: the bison. And so, in the chillingly methodical way of our kind, we did that with speed and efficiency. Hired hunters killed all day long, taking nothing but the tongue, or taking nothing at all. This, when Plains Indians ate each bison they killed clean, used every single hair and sinew from a carcass for something. I cannot imagine the disgust with which they must have viewed this waste, this obscenity we visited upon the animal they valued above all else. And upon them. I cannot imagine why we thought they should welcome us on their hunting grounds, or do anything other than send arrows through us on sight. We'd hang a man for stealing horses. What should be the punishment for sending the American bison, their sacred staff of life, to extinction? 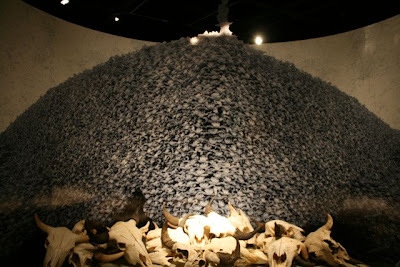 A photograph of a pile of bison skulls. Not bones, just skulls, stacked. We did this. Liam and I stood before this display and wept. We got rid of them, these animals that could teach any cow a thousand lessons about surviving a Montana winter, who could gain weight on forage that would starve cattle. From one of Charles Russell's letters. No one could convey the thunder and confusion of a herd like he could. The bison is an icon of the vanished West, and our world is now so cut up and controlled, so plowed under and compartmentalized, that there are no places outside parks where bison can roam, where they wouldn't have to push down fences or cross highways to find the food they need. Their hunch-backed, narrow silhouettes haunt me. Once, they ruled the Plains but are now reduced to remnant captive herds, or small wild herds confined to parks and reserves. Still, we'd go looking for them, for Liam's sake and ours. 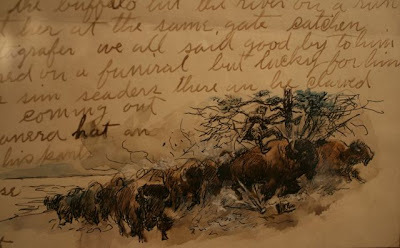 For more on bison and their superb adaptations, see my post, "The Durable Bison,"
It dates from the days when I had time to think and write more in this space. But that's OK, no regrets. Sometimes you blog, and sometimes you live your life. To every thing there is a season. Liam loves bison. 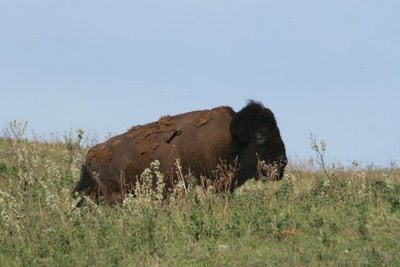 The bison is his favorite animal, and has been since he first saw them in North Dakota when he was little. 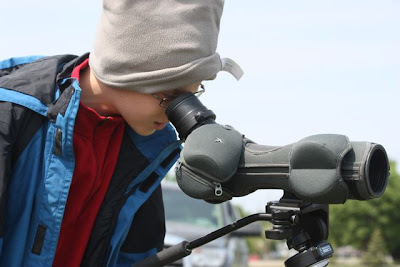 Bison help him tap into the prairie landscape and Native American history. And my little towhead has embraced the Native American reverence for the rare albino bison, and the white bison has become his spirit guide. 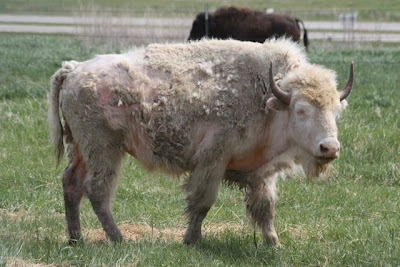 Some kids have superheroes or the Incredible Hulk; my boy dreams of white bison. There's a symmetry to that which pleases me, especially since you can't tell a child what to dream of; he must come up with it on his own. 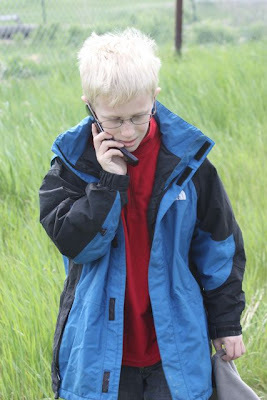 He watched the bison through a spotting scope for quite awhile and then let Phoebe have a turn while he called his friend Will in Ohio to tell him the amazing news that he, Liam, was standing before not one, not two, but three albino bison in Jamestown, North Dakota! It was hard for Liam to convey to someone who's never dreamt of white bison what this meant to him. Perhaps his snow-white hair makes him feel a kinship with them the rest of us can't. He's a pale rider. 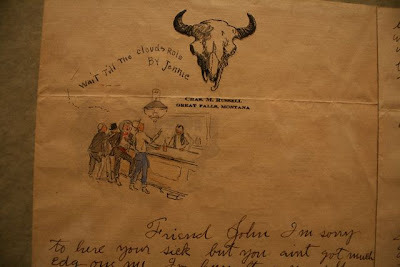 So I have found him a little turquoise deerskin pouch, and in the pouch is a carved white bison fetish, and a tuft of hair from the white bison at the Buffalo Museum. We got it by reaching through the chain link and grabbing it off some weedtops. He wears the pouch with its precious inclusions around his neck, and tries very hard not to take it off and forget where he put it down. Liam's spirit pouch has already been forgotten in a pocket and sent through the wash once, and everything is fine, except that the wool no longer smells so deliciously of bison. Liam asks me often if it's OK to have a favorite animal that is so rare. At a Montana museum, he saw and was deeply moved by an exhibit on the extermination of American bison. We reassure him that bison are still very much a part of the American landscape, and their numbers are rising again. Even the white ones, the powerful and sacred ones. The National Buffalo Museum in Jamestown, North Dakota, has cornered the market on white bison. On July 10, 1996, the day before Phoebe was born, a tiny albino calf was born in Michigan, North Dakota. She's a vanishingly rare creature, and she was named White Cloud. White Cloud went on to become a mother many times over. She threw four brown calves, and then in 2007 the impossible happened again: a white bull calf, Dakota Miracle, was born that August. But the saga isn't over by any means. 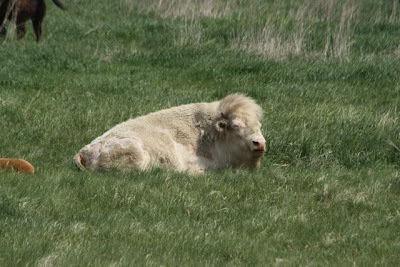 In May 2007, one of the Buffalo Museum's brown cows threw another white calf, and this one is named Dakota Legend. This is the only photo I was able to get of all three white bison in the same frame. 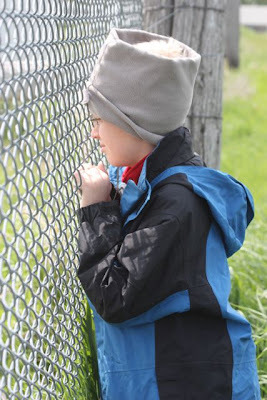 It's tough when you're behind a 9' chain link fence. Dakota Legend is the calf in the foreground, with his brown mama. That's White Cloud in the middle, and Dakota Miracle following her. 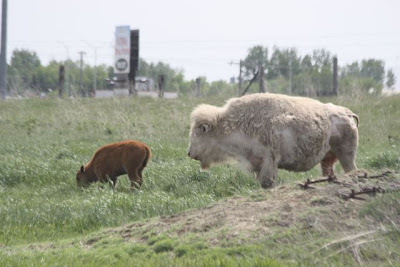 It seems obvious to a Science Chimp that some of White Cloud's progeny must be involved in line breeding for albino bison. As in: This three-bison amazement is likely not the natural accident you might think it is. 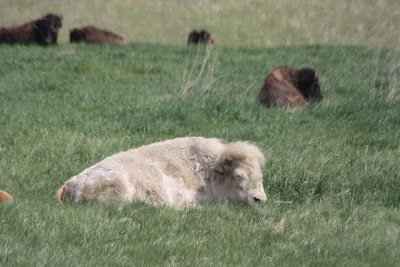 I'm guessing that a number of the wild type brown bison in this small herd of 30 may carry genes for albinism at this point. And being a recessive gene, both parents must carry it. 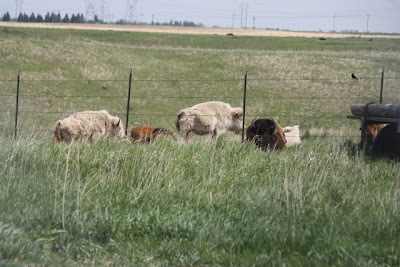 The herd is maintained by the North Dakota Buffalo Foundation, and they have 200 acres of nice pasture to roam on both sides of Interstate 94. 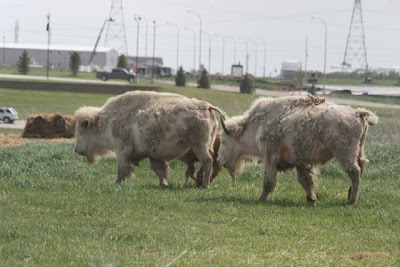 I honestly don't know if they're line breeding, but leaving a bunch of sorta related buffalo together who happen to carry genes for albinism is one way to get more white calves. And white calves bring the tourists in. If I had to pick whether I wanted to be a normal brown bison or a white one, I'd pick A.
Melanin, it turns out, is a wonderful thing. It helps with vision and hearing. Animals that lack melanin in their eyes and ears can have very poor eyesight and hearing. This is why Dalmatians and even Boston terriers born with white ears can be deaf. Without the strengthening structure of melanin, eyes and ears don't work too well. So white bison are a bit squinty, because the sun hurts their eyes. Make that quite squinty. 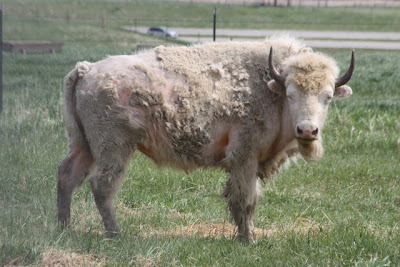 To be fair to the albino animals, no bison look their best in June, because that's when they shed their winter hair. This is Dakota Miracle, White Cloud's son. He'll be a wonderful bull someday! He's well on his way to magnificence. The red stains are probably caused by yeast--you see them around the eyes and ears of white dogs all the time. It does make you want to get in there and give them a good currying, though. Thing is, they wouldn't enjoy it, and neither would I. So I guess they'll just have to look scurfy until fall. Tomorrow, I'll tell you about Liam and the white bison.